With newly released Samsung Galaxy S10 family and the latest and coolest Galaxy Fold being ready to become the first commercially available foldable smartphone, Samsung might be set to take a stand on its launching devices until Galaxy Note 10. It seems, however, that this is far from the case and Samsung has revealed a large number of new A-Series handsets – led by an interesting Samsung Galaxy A80 in Australia. There is a fun party piece at Samsung Galaxy A80 as it doesn’t just have a pop-up triple-camera system but also rotates these three lenses to be selfie snappers. The handset indeed gets some positive feedback when it comes to showing this latest kit off to your friends. Let’s be honest, it’s actually much more than its party-piece camera as it comes with a Full HD+ 6.7-inches Super AMOLED display, a powerful Chipset, whopping 8GB of RAM, 128GB of onboard memory, super-fast on-screen fingerprint scanner and 3700mAh battery that keeps things running all day long. Without a doubt, Samsung designed its Galaxy A80 with extra care. It has an eye-catching and premium design with a metal frame all around its circumference that feels amazingly good while holding in the hand. However, it’s quite big and thick with dimensions of 65.2 x 76.5 x 9.3 mm – making it much different to use with a single hand and a pop-up camera means it’s a little heavy too. A power button is holding its position on the right-hand side of the handset whereas volume rockers are mounted on the left-hand side and interestingly, both are easy enough to press – as long as your hand is not too small. One will be able to pick it up in a choice of three sensational colours i.e. Angel Gold, Ghost White, and Phantom Black. Unfortunately, it lacks a standard 3.5mm headphone jack with a base of it’s featuring a SIM Tray as well as a single down-firing speaker and USB-C. Well, the most appealing part of the design is the pop-up camera that gets a section the same width as the handset rise up when switching to a selfie mode using a camera app. The subsequent spin and a smooth rise of a triple camera block is a fun novelty which online sources who tested, raised and lowered over and over again during their hands-on with Samsung Galaxy A80. It’s most likely that the novelty of that feature will soon ear off but they reckon it’ll still raise a smile every time the camera's pop-up and flip around to face you. However, there is some concern about this. We wonder how long the moving bodywork would last if you dropped off the A80, as with Oppo Find X which as a similar large pop-up camera section. Moreover, there are even more things that might break with the added complexity of the spinning camera. Perhaps it would be too difficult to fit a case which accurately and properly protects the handset entirely due to its moving section. So, you could have to deal carefully when choosing a Samsung Galaxy A80. The pop-up camera, however, provides an all-screen display that is not interrupted by an overall look, or by a notch or punch-hole camera. Samsung with its Galaxy A80 reduced the bezels to as narrow as possible all day with round the display which makes for an outstanding finish – however, it’s not a bezel-less smartphone. With Super AMOLED panel and Full HD+ resolution of 1080 x 2400 pixels, the display of Galaxy A80 is exceptionally bright, clear and colourful that should bode well for Netflix bingers and games alike. Although the display quality is yet to be tested by online sources. Most important of all, there is an on-screen fingerprint scanner – a feature that has generally been reserved only for super-fancy and expensive devices. So, it’s good to see this technology filter down to the next price tier. Again, online sources haven’t yet tested the fingerprint scanner's speed and accuracy during their hands-on experience. Therefore, we are keeping an eye on it and will put everything about it here later. The entire point of the Samsung Galaxy A80's rotating cameras is to use the same large cameras on the rear of the phone and on the front. Most smartphones tend to give you excellent rear and inferior front snappers. It's a good idea, with Samsung aiming to create, share and send live video content with the Galaxy A80 and the rest of its A Series on young people, that gives them the best camera experience regardless of how they use the phone. The main 48MP (f/2.0) sensor is the standard camera for you when opening the camera app, but it's much easier to switch between it and the 8MP (f/2.2) ultra-wide (123 degrees) camera allows you to fit more into your shot. Quality is not as high as the main camera, but it is good that you can open your field of view so easily. Samsung is not the first to do this - there are lots more similar Android companies - but it's good to see an embedded camera feature. The third camera is a 3D depth sensor that provides excellent background blur for Live Focus mode that de-focuses your background and maintains focus. That's the right answer to Apple's Portrait mode in iPhone. Based on reports from well-known online sources who have tested it, Live Focus seems to work perfectly – enables to adjust the level of blur and showing live results before hitting the shutter. It also gives you a Live Focus Video that blurs when you shoot videos for a visual experience. For real-time background blurring This mode is only available with the rear cameras’ configuration instead of the selfie and the same can be said with the super slow mode. Samsung is using a battery capacity of 3700mAh in the Galaxy A80 to keep things moving smoothly all day long. The battery can be charged quickly with 25 watts through “Super-Fast Charging” power supply. The battery life like its on-screen fingerprint scanner and display, it yet to be tested. However, the combination of FHD resolution and economical processor seem to give hope for at least two days running time with casual use. Digging down inside the beast, it’s powered by Qualcomm Snapdragon 730 Chipset – partnered with a hefty 8GB of RAM and 128GB of onboard memory that gives you a plethora of power as well as space for all your games, photos, videos, and apps. Alas, there is no expandable storage option here in Galaxy A80 – therefore, you cannot take it to the next level and cannot store a vast range of videos and apps. The Galaxy A80 runs on Android 9 with Samsung's One user interface on the top, which look and feel similar to the likes of the Galaxy S10 and S10 Plus. It's a light skin for Android that doesn't have a learning curve too much to get used to (especially if you move from another Android device). The official Samsung Galaxy A80 release date in Australia isn’t confirmed, for now. But Samsung has all set to launch it in some parts of the world on May 29, 2019. Countries that will get that beast first include India, China, and some other Asian countries. Samsung also said that it wouldn’t arrive everywhere at the same time. So, we should expect a little delay for official availability in Australia, as usual. In terms of Samsung Galaxy A80 Price in Australia, we are in the dark but it’s most likely to set the user back approx. AU$999-1099 which is significantly lower as compared to Samsung Galaxy S10 or S10 Plus. Will that undercut Samsung Galaxy S10e? Well, it’s yet to be seen. We are keeping an eye on it and will have that entire story updated as soon as Samsung drops more details. Where to Buy Samsung Galaxy A80? The Galaxy A80 doesn’t launch yet in Australia, as mentioned above but we are trying our best to bring it for Aussies as soon as it launches. 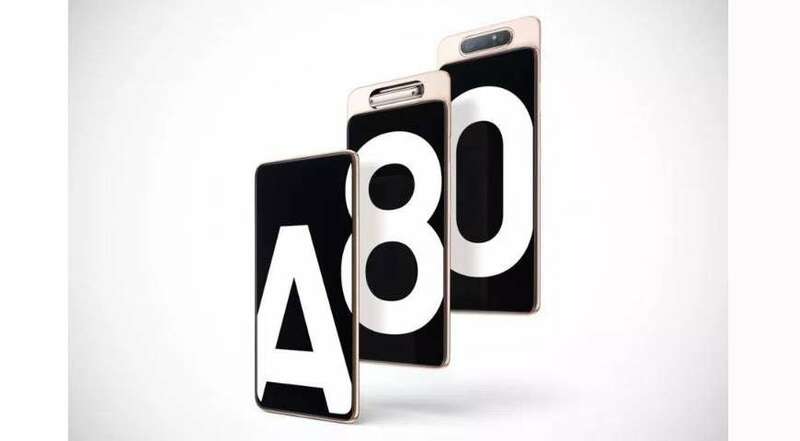 Once, it’s available, you will be able to use our search box to find out Galaxy A80 which will be offered by all major online stores across Australia i.e. JB Hi-Fi, Kogan and others at unmatched rates alongside deals and instant discounts. Without a shadow of a doubt, Samsung Galaxy A80 is the most-appealing smartphone without leaving a dent on your budget. Its rotating pop-up cameras actually draw the attention of everyone to the Galaxy A80 but it’s also true that it’s not just a one-trick pony. Samsung has added numerous decent features to make that beast a compelling smartphone. Eventually, the success of Galaxy A80 comes down to its price and as of now, we are short on words on how much will it set users back. Expecting a little hike in price wouldn’t be wrong thanks to its motorized camera block and a large display.